The décor has that old school look that literally reminds me of school, the mix of wood and metal has a retro vibe to it. 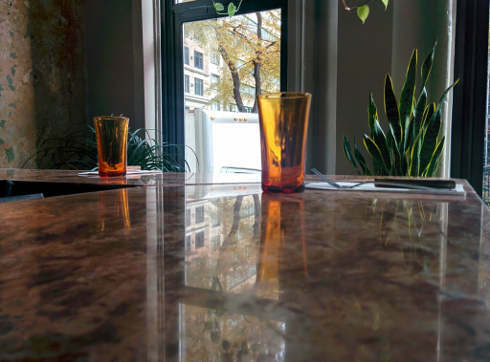 This is thanks in part to local architect Zebulon Perron who has been involved in various projects such as Grinder, Hachoir and Furco to name a few. Once you walk past the vestibule you will see a large dining area on your right with large street facing windows and a terrace in the summer. This time I went with Diva #2 from the Montreal Food Divas and we ended up sitting at the bar which is the best spot for two people since you can chat in a more laid back setting. Food There is a breakfast menu available all week and some items only available during brunch. Most items are priced under $10 with the exception of the breakfast pizza, which is $14, coffee is $2.75 for drip although does not come with refills. 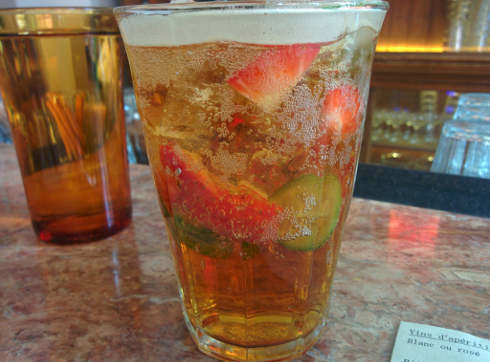 We started off with some liquid nutrition, Diva #2 had a Pimms Cup $9 which has Pimms, cucumber, strawberries and ginger ale . 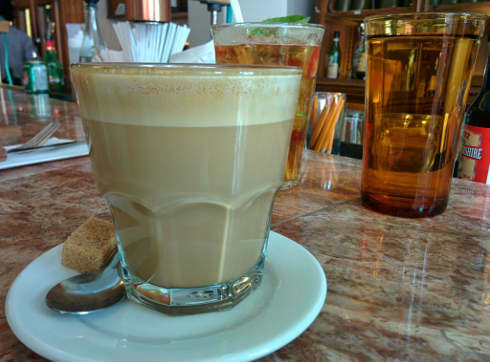 This is always a great drink to have and Café Parvis did it well. 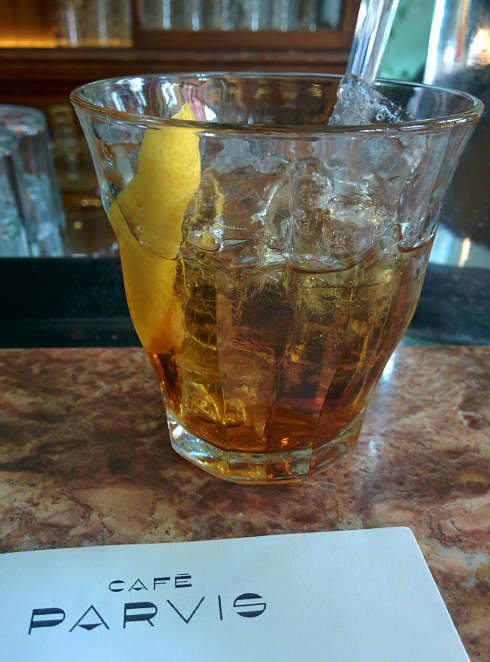 I ended up having the Negroni $9 which was made up of Campari, gin, Chartreuse, vermouth, and lemon. This drink never disappoints and although it has a more pronounced taste than a sweeter drink, I like the kick to the taste buds and is a nice way to wake up. 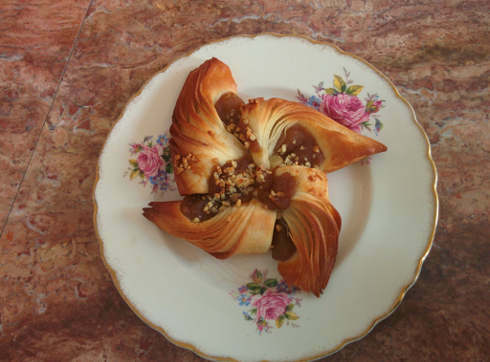 We started off with a pastry $3.00 which was an apple pastry shaped like a star, the shape was interesting as was the taste, it was a nice little something to share over coffee as I discussed with Diva #2 all the bad things she and Diva #1 have done over the years to me. For our main dish Diva #2 had the special brunch quiche $8 which is only available on the weekend. 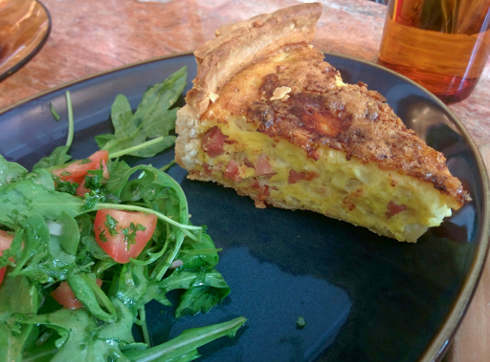 The quiche is the classic ham and eggs quiche which was a fair size with a side of salad. The quiche portion could have been larger although having finished a morning yoga class I was a little more hungry than normal. The salad it came with was quite good and although not a fan of salad for brunch it worked well mainly because the dressing was impressive. Next up was the breakfast pizza $14 which was described as a Mexican pizza with large pieces of deep fried avocado, salsa and slices of tomato. 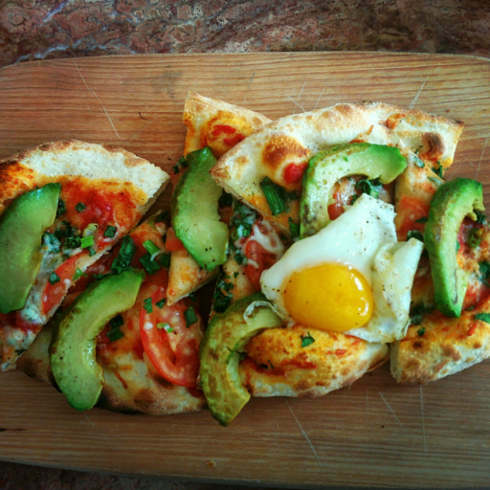 I personally have an issue with breakfast pizza based on the fact that pizza and brunch are 2 amazing things on their own and are hard to combine in an equal or greater force. Now the breakfast pizza at Café Parvis came close to this and to be honest only 1 other place has done this and that is a pizza place in Brooklyn. The key is that the dough was thin and light, you don’t want to have a heavy dough early in the morning, you want light and fresh, and with an egg, which it had. The amount of tomato was limited, which in my books is a good thing since tomatoes have a high acidity content and that is not something you want to wake up to. There was also a bonus item we decided to splurge on and that was the fruit cup $4.50 which for the price is actually a deal. 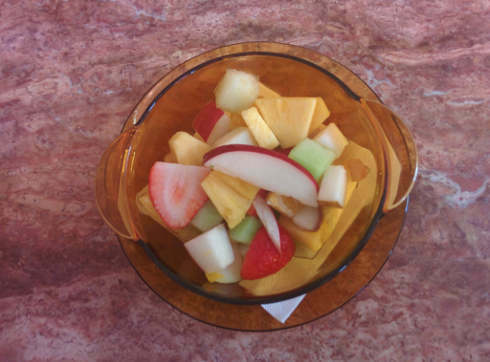 The portion size is fair, the fruit is fresh and tasty so as options go it’s a winner. Service Our waitress was great, she was friendly, helpful, and laughed at our jokes. She helped explain the menu and was very patient as we vacillated between dishes. Vegetarian Most dishes here do not have any meat, so vegetarians should have it easy here, as a café there’s lots of baked good to choose from so you have plenty of options. Wrap up I liked brunch at Cafe Parvis. 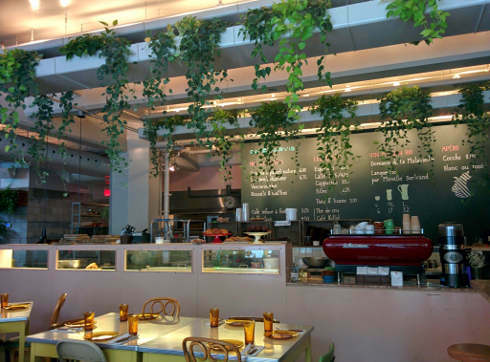 The décor is cool, the vibe if good, food is tasty and relatively well priced. 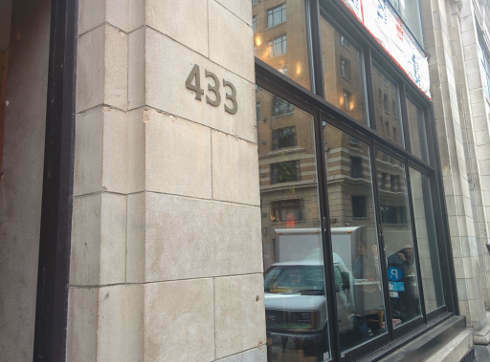 We will definitely suggest it for those looking for a good option in the downtown core/Golden Square Mile. Food is delicious. Do not expect to make a specialized order. I did not want any cheese in my salad but that was not possible. Service is horrible. We were three people and we all got the feeling that they did not want us there. Waitresses seem clueless. We had our laptops and we asked if there was a place near a plug so that we could plug our laptops and the waitress had to go get the manager for this simple question. The manager told us to sit at the bar and she did not even plug our computers. HORRIBLE WILL NOT RETURN.